Founded in 1832 in Saint Imier, Switzerland under the name Raiguel Jeune-Cie, the company to be soon known as Longines, was the first to work outside the established model of timepiece making by starting their own assembly factory. By eliminating the middleman, the component trading office allowed Longines to set the stage for exporting their distinctive timepieces to the American market. 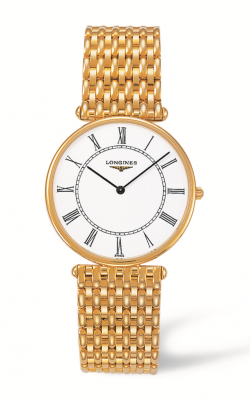 The name Longines came about in 1876, when the company adopted the name from its new location - the "long meadows". Gaining momentum in the timepiece market, Longines became well known for its expertise in chronographs, specifically in their aviation and sports timepieces. Through the decades, Longines modified and improved the internal movement and the external appearance of its timepieces. The Lindberg watch was created to simplify and improve navigation and is still available in more modern versions. Today, Longines is best known as the official sponsor of the Kentucky Derby. Longines continues to bring innovative and improved mechanics in timepieces to the market cementing their place in timepiece history. Merry Richards Jewelers carries a distinctive and extensive collection of Longines watches; the styles ranging from sport and casual to classic and elegant watches. Each Longines watch exemplifies the best of mechanical operation as well as a styling reflective of its heritage. The Longines watch, with its specialized proprietary movement is a favorite among sports enthusiasts as well as the everyday consumer. Merry Richards Jewelers is honored to be an authorized dealer of the 100% authentic Longines watch collection. Why Buy a Longines Watch from Merry Richards Jewelers? Merry Richards Jewelers and Longines share a history of innovation and modernization. As a leader in the fine watch industry, Merry Richards Jewelers honors a history that can be traced back to Philadelphia in the 1800's. The producer of the Congressional Medal of Honor and several other distinguished military medals, Merry Richards Jewelers is committed to doing business only with brands that embrace the company's values. Merry Richards Jewelers has impressively captured and maintained a first-rate reputation in the competitive jewelry world. Merry Richards Jewelers operates businesses in Oakbrook Terrace, Illinois. Merry Richards Jewelers takes great pride in offering a revolutionary shopping experience. Their commitment to providing superb customer service helps solidify the strong bonds they build with todayâ€™s perceptive consumer. To meet the ever-changing demands of its customers, Merry Richards Jewelers offers a luxurious shopping atmosphere and exclusive brands that are unrivaled. All Longines watches in Merry Richards Jewelers inventory are of the highest quality styling. 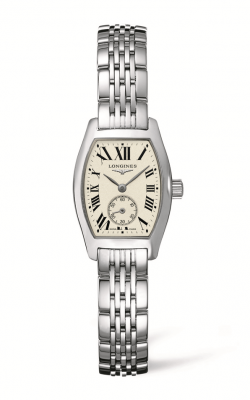 Check out the classic unisex design of the Longines Watch L4.691.6.11.6 from the Agassiz Collection. With the expertise of the well-trained staff at Merry Richards Jewelers to assist you, the timepiece you select is guaranteed to withstand the test of time.